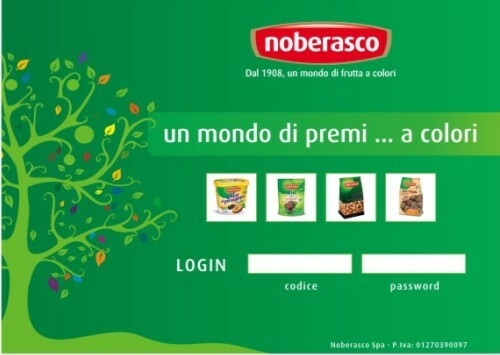 A World of color awards the operation of incentive Noberasco, the leader in the dried fruit industry. Noberasco has experienced different levels of participation. In addition to the directors and area managers, all agencies were able to access the portal and see, in real time, how they were performing in their areas of expertise. The simulator also allowed them to immediately see the advantages of Noberasco’s quality that they could then propose to their customers. Noberasco has been a leader in the dried fruit industry for over 100 years. They have remained the leader in Italy in their industry not only due to the experience of a century of activity, but also because of the attention paid to the qualitative aspects of the supply chain. The company is characterized as a vibrant entrepreneurial dynamism, and innovative effective marketing company. Noberasco does not stop - there are new goals to reach! The strategy for the next 100 years is summarized in the mission: "To allow the consumption of fruit away from harvest time, without compromising the healthy and nutritional content, and building a better relationship with the customer and the end consumer." "4incentive has given our company a viable and effective solution to boost our sales force. They have upgraded the traditional formula and are highly flexible, professional and always available." Noberasco needed a mechanism that had incentives suited for all types of participants, especially the largest target market which was agencies. The second requirement for the system was to be able to reward products differently. This ensured a higher rotational line with higher margins and also favoring even consumption throughout the year. 4incentive ranked the agencies and placed them in 9 clusters based on their different capabilities and product lines and then in 5 other clusters showing increased profitability. Each participant was rewarded according to their potential and what was actually sold for a total of 45 possible variables for assigning the points. This complex system was managed at the level of the back-office platform, and not visible to the commercial network. In fact, at the time of login on the portal initiative, the agency is recognized by the system that then brings it to a customized simulator based on its own characteristics. The results were significant with increases in sales of the types of products that were predetermined to be rewarded the most. The operation was proposed again for the third year and, as often happens in this type of initiative, the agencies that received awards in the first edition, intensified their trade relations with Noberasco. In addition, the initiative has also served to consolidate the image of a dynamic and innovative Noberasco . Copyright © 2019 4Incentive Inc - All rights reserved.